Billion Dollar Gran Fruit Machine Guide & Review - Casino Answers! 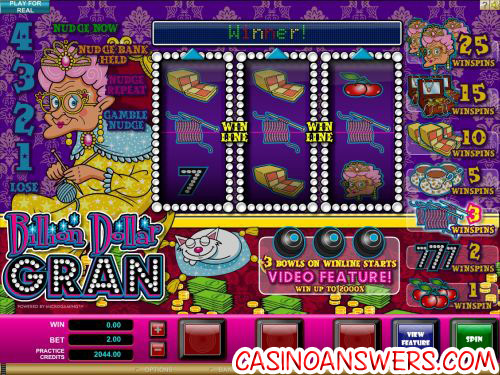 Billion Dollar Gran is a 3-reel, 1-line fruit machine developed by Microgaming, featuring a hold feature, a nudge feature, a free spins feature, a bonus game and more. You can play the Billion Dollar Gran fruit machine at Jackpot City Casino and Ladbrokes Casino. Playing Billion Dollar Gran is easy. There are no paylines and coins to worry about, just your total bet amount. You can bet $0.10, $0.20, $0.25, $0.50, $1, $2, $5 or $10 per spin. Once you’re ready to play, all you have to do is hit the “Spin” button and the reels will spin. There are no payouts on winning combinations here. Instead, you can win money through Winspins. On every winning combination you get in the regular slot game, you will be taken to the Winspins slot game. Winspins are essentially guaranteed win free spins. On every spin, you will get at least one win, usually more. Depending on your winning combination, you can win from 1 to 25 Winspins. You will be taken to a new 3-reel, 5-line slot game with symbols paying from 1X to the 500X top jackpot. See if you can win the Billion Dollar Gran jackpot by playing it at Jackpot City Casino! One of the most common features in found in fruit machines is the nudge feature, which is present in Billion Dollar Gran. Using nudges, you can bump above symbol on the reel down a position to hopefully create a winning combination. You can also bank (save), repeat and gamble nudges in Billion Dollar Gran. You will be able to win up to four nudges per spin in the Billion Dollar Gran casino game. Another one of the most common fruit machine slot features is the hold feature, which is randomly triggered. It will allow you to hold as many reels in the same position as you wish for the next spin, if you so choose. There is also the Shifta! feature on the Billion Dollar Gran slot machine. Like the hold feature, it is also randomly triggered. It will spin the reels into a guaranteed winning combination. If two of the same symbols are displayed on the winline (or payline) after you have used all of your nudges, you can use the Let ’em Spin feature to automatically spin a winning combination without holding any reels. 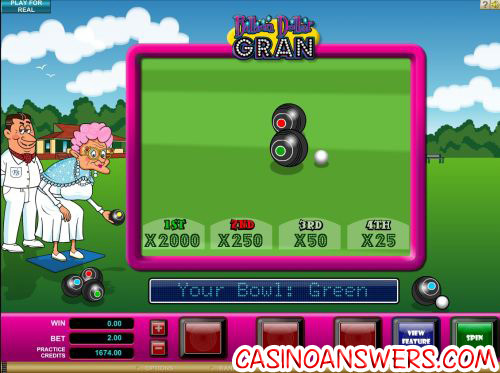 WinSpin payouts in the normal Billion Dollar Gran slot game are: 3 Cherry symbols (1), 3 Sevens symbols (2), 3 Knitting symbols (3), 3 Tea symbols (5), 3 Battenberg symbols (10), 3 Jewellery Box symbols (15) and 3 Gran Head symbols (25). Payouts in the Winspins slot game are: 3 Knitting symbols (1), 3 Tea symbols (2), 3 Battenberg symbols (5), 3 Jewellery Box symbols (10), 3 Boat symbols (25), 3 Toyboy symbols (100) and 3 Gran Head symbols (500). Regular slot game winnings are awarded for the symbol combination displayed on the winline only. There are no cash payouts for regular slot game winning combinations, only WinSpins. WinSpins slot game winnings are paid out for the highest combination on each winline. All WinSpins slot game payouts are in credits. Malfunctions void all plays and pays. Billion Dollar Gran is exactly what we look for in a fruit machine – lots of bells and whistles to go along with an amusing theme. If you’re into fruit machines or even if you are a regular slot machine or video slot player who wants to see what they’re about, you can head over to Jackpot City Casino and take advantage of their 100% up to $500 signup bonus! Is there a Billion Dollar Gran Flash game? Yes, you can play a flash game of Billion Dollar Gran fruit machine for real or real money using Jackpot City Flash Casino. If you experience any issues playing the Billion Dollar Gran flash game, try downloading and installing the latest version of Adobe Flash Player. How do I trigger the bonus feature on the Billion Dollar Gran AWP? To trigger the bonus game on Billion Dollar Gran, you must get three bowling ball symbols on the payline. In the bowling bonus game, you can win up to 2000X your bet! What are some of the other fruit machines I can play? Other fruit machine games you can play at Jackpot City Casino include: Bingo Bango Boom, Cops And Robbers, Deep Sea Dosh, Fire N Dice, HipHopopotamus, Pub Fruity, Ski Bunny and Track & Field Mouse. We constantly get requests for new fruit machine reviews at Casino Answers, so expect to see more reviews for pub slots in the near future. Are USA players able to play Billion Dollar Gran for real money? Unfortunately, Microgaming online casinos aren’t accepting registrations from casino players located in the USA at this time. For some interactive slots that share some similarities to pub slots, fruit machines and AWPs, check out the iSlots at Paradise 8 Casino.